Catherine Tracy has been teaching Picasa to her computer group at Sun City Hilton Head for several years. 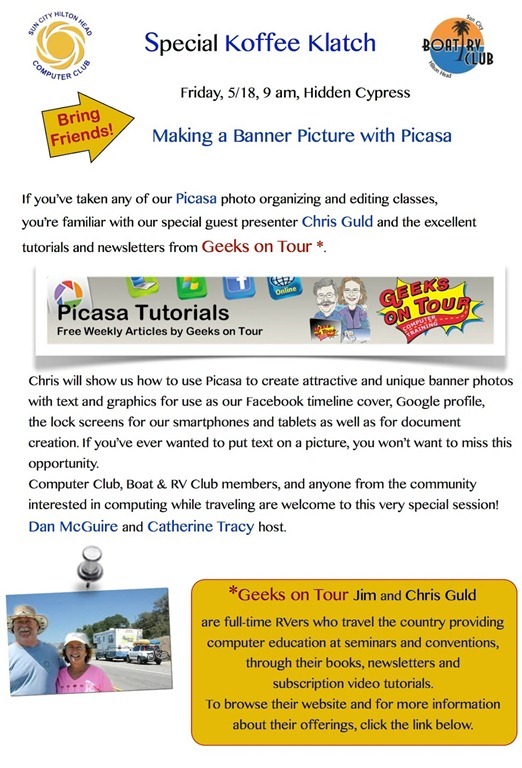 She’s also been a member of Geeks on Tour and active on our Picasa Forum, sharing her experience with Picasa Web Albums on her iPad. We’ve discussed a Geeks on Tour presentation for her computer group sometime in the Fall, but when she heard we’d be traveling thru her area in May, Catherine arranged for a small group presentation this week. Over the years, Catherine has recommended Geeks on Tour membership to many people – so we are happy to return the favor and present a free seminar for her group. We loved that she came up with a specific topic: Making a Banner Picture with Picasa. It will be a pleasure to teach one topic rather than the overview seminars we usually do. Check out the flyer for the event below. This meeting is just for the Sun City group. If you would like us to present at your group, contact us. If we’re in your area, we’ll try to put it on our schedule. If not, we may be able to arrange a remote seminar with Skype. Published by MrsGeek, in Blog. Tagged with Picasa Collage, Sun City Hilton Head.